I should have published this months ago. So let's see whether stuff has changed. 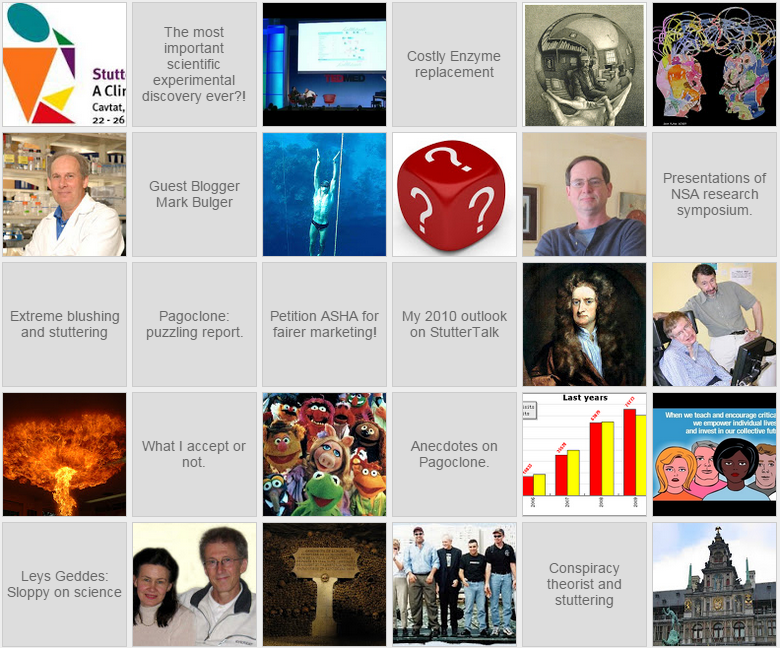 Jerry Maguire, chief investigator of the Pagoclone trial, was on StutterTalk.com. As I speculated, most patients from the Phase IIb trial have completed the trial period. In two months' time, all will have completed. So that would take us to the end of the year. I forgot the fact of the data being locked and the blinds only being removed once all results are in. That definitely makes sense. In a double blind trial, neither the patient nor the reseacher know which pills are placebo, i.e. a sugar pill, and which contain the to-be-tested compound. So they do not know more internally than we do. However, from the outcome measurements, they can already take averages across all participants (from high dosis to no dosis placebo). You should be able to look at the time evolution. I would predict that the outcome went positive after the first testing and then slowly declined. results now? :-( The Phase IIa are presumably better controlled for loopholes and a bigger sample. The publication process in medicine is really a scandal. They should start doing pre-prints like in physics. TEVA, an Israeli company, owns the destiny to Pagoclone, and it will be up to them to decide whether to go for an expensive Phase III trial. So what happens if Phase IIb is successful? Jerry talks about there being a Phase III before the FDA accepts Pagoclone as a stuttering medication. However, I guess you can probably get it off-label. Especially because the side effect seems to be very moderate. Peter and Eric asked about clinical significance. At what point is Pagoclone successful? 30% decrease? Or more? That's a good question. 30% is a lot for severe stutterers, but for someone who just stutters occasionally and fears such situations things won't change much! I was struck by Jerry's subtle change of tact. He was more sober than usual about the prospects of Pagoclone. My feeling is that Pagoclone is not going to be the cure that some are looking for. Might even be a mirage. Sorry. Jerry keeps on saying that it should be combined with psychotherapy. I agree, but only if Pagoclone is shown to have some efficacy. What I am most interested in is the placebo effect over the long-term. It is leveling off to zero. That would be good news for the reliability of such trials. If not, does placebo really reduces our stuttering long-term or is it the design and act of measuring that makes it look as if there is an improvement? Plenty more news and a critical review coming on this blog! What is the SFA Brain Trust? In the next interview with Jerry Maguire it would be an interesting question to ask him to disclose the extent of payments that he personally receives and will receive in the future from the drug company that manufactures Pagoclone. If this trail is successful there will be a lot of money to be made by all concerned, including the researcher who is pushing for its acceptance by the FDA. The drug company stands to make mega dollars as a result of people of all ages becoming drug dependent because of their stuttering!! I think this post is unnecessarily pessimistic. Pagaclone may not be able to cure everyone but it certainly will pave the way for further research. I think it's a shame that technology and science have advanced so far and there still isn't any official treatment for stuttering! Tom's intensive preoccupation with the placebo effect may miss the point in some instances. The effects of tranquilizers (at a given dose) wear off over time but I doubt that could be attributed to a placebo effect. Rather, the "wearing off" is caused by a tolerance being built up to the drug. So, stop using the drug for a while and the desired effects will resume. Pagaclone binds to BZ binding sites similar to old fashioned tranquilizers so you very well may get this "tolerance" effect. For me, It will work. Because, since I take Prozac and anxyolitics, my fluently habe been improved for about 80 % so for some persons It coudl work!